On a balmy Friday evening the Whalers gathered in Regent’s Park for their one and only T20 fixture of the season versus Clapham Inn. Captain Will, evoking memories of the Corfu tour, tossed up using a Euro and chose to bat first on a very dry looking pitch. In line with Clapham skipper Joel’s request, it was agreed that every outfielder must bowl 2 overs and batsman to retire at 25, but with the option to return later in the innings. Sensing the need to get early runs on the board, the Whalers’ kiwi contingent (Geoff and Andrew) were sent out to open the innings. The Whalers soon discovered that timing a ball on the pitch was quite a bit harder than anticipated but Geoff managed to get a few edges away to the boundary. Soon after Andrew was bowled by Boyle for 5 in the 3rd over. Will joined Geoff and watched from the other end as the latter hit Taylor for a couple of big hits to the cover boundary. Geoff soon reached his 25 and duly retired to take up important umpiring duties. Matt came out and 4 and started to pick up singles with some sharp running between the wickets. Then Will, clearly having watched too much franchise T20, attempted to walk down the pitch, instead missing the ball and being stumped by the gleeful Shinner behind the stumps. Al and Matt then set about building a partnership, picking up singles and punishing anything loose. Continuing his good form from the previous Sunday, Al started to find the boundary with regularity. Matt soon retired for a well-made 25, bringing Dan to the crease, and Al followed him to the milestone shortly after. With 16 overs gone, the Whalers were looking strong. Step forward 8th change bowler Shady, who dispatched of Josh for 2 with the first ball and knocked over Russell for a golden duck the next. Jack and Dan saw out the rest of over, but Clapham were not done yet. Left-armer Langham removed Jack with an excellent caught and bowled and then Dan, trying to up the run rate, ran out the unfortunate Amit for the second time this season. Geoff returned to fray but failed to repeat his earlier heroics, getting cleaned up by Shady second ball. Matt managed to rotate the strike but could only watch as Dan was bowled by another cracking delivery next ball. Al survived the last two balls, and with Matt, picked up some crucial late runs from Langham’s final over. The Whalers finished on 156 after their 20 overs, Al finishing 31* and Matt 29*. Honourable mention should go to Extras who made a significant contribution to the final total. With a decent total behind them, the Whalers went out to field with some confidence. Dan and Jack opened proceedings, keeping the scoring tight and pressurising hte openers. In his second over Jack dismissed Shinner for 2, well caught by Matt at mid-on. Clapham skipper Joel played some nice shots off Russell’s first over, in an attempt to get his team back up with the required run rate. He was soon bowled however; Amit striking in his first over. That brought Taylor to the crease who immediately found the boundary, being particularly severe on anything short. Russell’s second over was a flurry of boundaries and the Whalers were left scratching their heads. Step forward Josh and Matt, the latter displaying his new shortened run up. Matt dismissed No.3 Frecknell in his first over, excellently caught by Russell, and Josh removed No.5 Langham for 0 in the final over of his spell. Both also managed to pin down the free-scoring Taylor with very tight lines and lengths. The Whalers were now well on top. In line with the pre-agreed rules, the lesser sighted bowlers began to appear. In preparation for Captains v Presidents, Al started to trundle in from the bottom end but was deposited for a 4 and a big 6 by the dangerous-looking Robbins, following Taylor’s retirement for a well-made 25. Will yorked Robbins in his next over and then removed Wilkes 3rd ball. Not to be left out, Al then claimed his first scalp of the season removing Ashelby LBW for 1. Geoff and Andrew rounded off proceedings, with both claiming a wicket each from the Clapham tail. Taylor returned, but it was far too late for him to effect proceedings and Clapham finished their 20 overs with 105 on the board. So a 51-run win for the Whalers, and another commanding performance. All eyes look ahead to Captains vs Presidents on the 30th and continuing the success into the second half of the season. This entry was posted in Uncategorized on June 26, 2018 by whalers1. Under greyish skies the Whalers gathered at Kings House to play the Lambeth Lambs, aiming to make it 4 wins on the bounce. Captain Will, nursing quite a severe hangover, promptly lost the toss with the Lambs skipper (another Will) opting to bat first. News of an unfortunate last minute pull out for Khalil meant the Whalers were a man short heading out to field. Dan and Russell took the new ball and immediately found some early movement, in part thanks to some favourable overhead conditions. Encouraged by a number of play and misses, Dan put Geoff in at first slip. Very next ball an edge flew in his direction, but unfortunately a tough chance was grassed. Into the next over and Russell found the edge which again flew in Geoff’s direction, but again he couldn’t hold on and the ball trickled away in the direction of third man. Buoyed by two lucky escapes the batsman tried to push for an optimistic second but underestimated the arm of Dan whose throw left the opener Bali a yard short of his ground. Russell and Dan continued to keep things tight but no more wickets were forthcoming, despite some more edges. Amit came on first change and immediately got into the wickets, beating Weatherald’s defensive push to castle the opener and removing opposing skipper Will via an inside edge which was fantastically caught by Dean behind the stumps. Paul, making his season debut, started his spell into the wind and shortly enticed number 4 O’Halloran into a loose shot which was held at mid-on by Josh, reducing the Lambs to 41-4 off 13 overs. The Lambs started to rebuild with number 5 Birrell-Gray in particular capitalising on anything short. But the chances kept coming, however the Whalers couldn’t take advantage putting down 3 or 4 tough chances (the ball seemed to follow Al around) and the other edges didn’t go to hand. It took until the 20th over for Amit to pick up his 3rd wicket bowling number 6 Stone with another swinging delivery, to break an important 48-run partnership. The Whalers were in good spirits as they walked off for a well-deserved, and slightly delayed, drinks break. Birrell-Gray was joined by Hegarty and the former put his foot down following the drinks interval striking some lusty blows, including a massive 6 off Paul. He went to a well-made 50 soon after. In need of some inspiration, Will turned to Josh’s spin, which immediately paid dividends as he claimed the scalp of Birrell-Gray in his first over, well-caught by a redemption-seeking Geoff for 59. Out walked May, who made his intentions clear by promptly dispatching Josh for 3 boundaries. Some more lusty blows followed, but Josh held his nerve and persuaded him to sky one to Dean at long-on, recently relieved of his wicketkeeping duties. The Lambs were 138-7. Geoff came on to bowl at the tail and immediately got himself amongst the wickets, one well-caught by Al at point and another by Dean at long-off. He soon bowled No.11 Talbot to finish with a very impressive 3 wickets for only 4 runs off his 2 overs. The Lambs finishing 151 all out off 31 overs. A good display from all bowlers, but special mention to Dan for an outstanding, but ultimately unlucky, 7-3-12-0. Al and Dean opened up for the Whalers and got into their stride despite some tight bowling from the Lamb’s openers. Dean was particularly severe on anything short getting some pull shots away to the boundary. Al was slightly more circumspect but got going with a few nice drives and helping the Whalers to rattle along to 56-0 off 10 overs. Dean continued to attack, taking a particular liking to first change bowler O’Halloran, including a massive 6 over mid-wicket. Having raced to 49 he tried one pull too many and was caught by Birrell-Gray at deep-square leg off the spinner Moran, cue murmurs of jug avoidance. With the score at 84-1, captain Will strolled out see his team home and fight back his worsening hangover. Sadly after a couple of nurdles, he was soon making the return trip having managed to drag a legside half-volley onto his stumps. 95-2. The second wicket brought Channa to the crease, despite a strained hamstring obtained whilst fielding. Despite a tricky start to the season and not having not yet scored a run with his new bat, he managed to get a few singles and give valuable support to Al. Al continued to regularly pick up boundaries, putting away any loose deliveries and milking singles off the better balls. He eventually brought up an excellent 50 with a 4 off Moran. At other end Channa manfully stuck to his task, despite his limited mobility and started to find the boundary with some lusty blows. They started to build a good partnership and edged the Whalers closer to their target. A flurry of boundaries from Channa saw the Whalers reach their target of 152 in the 27th over, completing a comfortable 8-wicket victory. Al finished with 65* and Channa a very useful 32*. Overall another very good win and the Whalers march on! Champagne: Dean’s catch off an excellent swinging delivery from Amit. This entry was posted in Uncategorized on June 18, 2018 by whalers1. It was another hot Sunday afternoon as the Whalers reconvened looking to make it 3 wins in a row. Although this was an away game the game was played at our regular King’s House venue and so the only extra travelling was the long walk to Pitch D. The opponents were Salix and they didn’t appear to be too confident in ending the Whalers’ winning streak as they requested a non timed, time game (a maximum of 70 overs to be bowled) due to a perceived gulf in quality between the two sides. Will (captain) was happy to oblige and duly won the toss and elected to bat. The Whalers lined up as follows: Al, Channa, Will (c), Geoff, Dan, Jordan (debut), Josh, Jack, Russell, Nick and Kamal. From the onset it became clear that the pitch was going to be low and slow. This combined with a large outfield meant it looked like the boundary count was going to be on the minimal side. Salix’s two opening bowlers started well and it was obvious we were going to have to work hard for our runs. Channa, filling the rather big shoes of Dean was unable to produce any of his fellow left hander’s big hitting as he lofted a straight drive into the air 3rd ball to depart for a duck. Will came in at 3 and together with Al was able to get the scoreboard moving with lots of 2s and 3s and the occasional 4. Al departed for a dogged 20, succumbing to their first change bowler, Padmore. Will was joined at the crease by Geoff who wasted no time at all in getting stuck into the attack. After bludgeoning a couple of 4s and also a six his entertaining but brief stint after he mistimed an Ellis delivery on the leg side and was caught at midwicket. Dan was the next man in at 5, slightly higher than he is normally accustomed to but the long boundaries suited his game and he soon set about scampering between the wickets. Will was then bowled for 33 to leave the Whalers at 92-4 and debutant Jordan striding out to the middle. Dan and Jordan put on a good partnership but with the Whalers looking to up the tempo having reached the 30 over mark Dan was caught in spectacular fashion at deep mid off to walk back for a well crafted 35, leaving the Whalers at 139-5. A combination of Josh, Jack, Russell and Nick the combined to get Whalers to a respectable score of 166/8 from 36 overs before Will decided that was enough and declared. Needing 167 to win against a Whalers attack with a variety of options, you felt that Salix needed to get off to a good start to win or draw the game. This wasn’t to be the case though as Nick took care of their two openers, the first a nick well held at slip by Geoff and the second a fairly hefty drive that managed to find Josh at his customary mid off position. This however brought their number 3 (Yovan) to the crease and it soon became apparent that he could play, hitting some powerful shots all around the ground. Kamal in particular was on the receiving end of fierce hitting but his patience was rewarded as he bowled Yovan out for 37. Salix’s hopes now appeared to rest with Grant (mistakenly misheard in the scorebook as Crufts) but after being dropped behind by Dan who was deputising as WK, Russell eventually got his man bowled. He then proceeded to get two more, one with the assistance of a diving Jack, to leave Salix 5 down. Josh was then given the ball and surprised most people including himself by occasionally pitching the ball somewhere near the stumps and managing to grab a couple of wickets. Jordan made it a fine all round debut by taking his first Whalers wicket before Jack finished things off after their number 10 generously left a straight one. Whalers: 166-8 declared. Dan 35, Will 33. Salix: 95 all out. Russell 3-19, Josh 2-9, Nick 2-16. All in all a good team performance. Champagne moment: Kamal- for taking the most important wicket of the day. Muppet moment: Josh- for a premature slide about 3 metres from the ball. This entry was posted in Uncategorized on June 12, 2018 by whalers1. 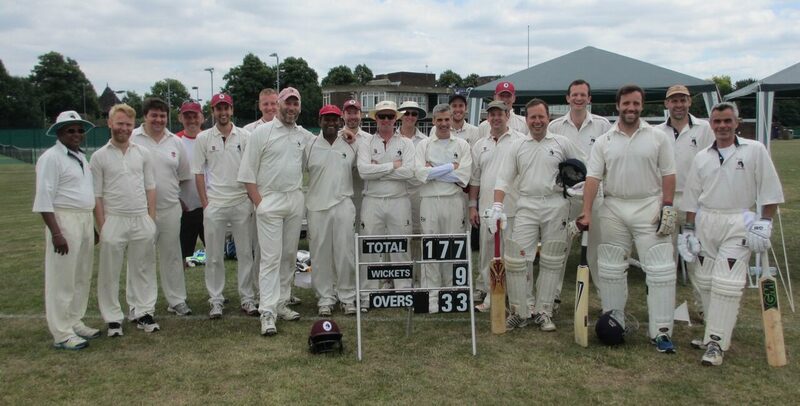 On a sunny Saturday afternoon Whalers gathered for our annual match with Clapham Inn which has always proved to be a good battle, and this game proved no different. The Whalers 11 featured Amit on Whalers debut and 4 other season debuts, Josh, JT making a long awaited return and our friends from Cairns Fudge, Andrew and Marcos helping us out again. After winning the toss (for the first time this year!) Will opted to bat on another good looking Kings house pitch. Dean and Marcos opened up with a fast start while the opening bowlers were finding their length but once they had things became a lot tougher as the run rate was pegged back. The breakthrough came when Dean received a pearler / jaffa / bonzer delivery from impressive opening bowler Langham which knocked off his off stump bail, by all accounts it was a great ball – Dean agreed but thought that might not quite have done it justice. 38/1 in the 9th over soon became 65/4 as the collapse was on, and the Whalers looked around for someone to halt the slide, step up Andrew who started hitting some lovely shots all round the wicket, including a huge baseball style straight 6, and along with Will added 58 for the 5th wicket. Cue the second collapse as 2 further wickets fell quickly including Andrew for 51. At 138/7 in the 29th over things were delicately poised but first Geoff and then Dan, both with good support from Amit were able to push the score through to 187 before Dan forgot that debutant Amit wasn’t familiar with ‘Dan’ running and Amit was left well short running a third. leaving Jack one ball to show off his cover driving skills, leaving the Whalers with a total of 189, which seemed maybe a hint above par, but early wickets would be helpful. Jack opened up with Dan and with some good accurate bowling they both delivered an early wicket, bowling one opener each., the downside effect of this was it bought in their number 4 Owen who was playing some great shots including a huge effortless looking straight six off Geoff’s first over. Geoff and Amit then just about held things in check, the breakthrough came in the 14th over when Geoff grabbed a smart return catch, albeit with a juggle, and Amit followed this up in the next over with his debut wicket, a super diving catch from josh at backward point. Andrew chipped in with a caught and bowled and the run rate headed north of 8 with 10 overs to go but Owen was still in. With the game in the balance Will came up with a captaincy masterstroke and introduced Dean to the bowling crease with his array of highly effective low full tosses which bought immediate reward with the key wicket of Owen chipping a return catch. Dean followed that up with 2 further wickets and Dan finished things off with the last wicket in the final over for a 22 run win. All in all a great game that ebbed and flowed and was either teams to win until the final couple of overs. Muppet – Dan for running out debutant Amit. This entry was posted in Uncategorized on June 5, 2018 by whalers1.